I moved to Abu Dhabi two and a half years ago, and in that time I’ve had over 25 visits from friends and family from back home. I bang the drum for Abu Dhabi as a place to live. I think life here is great, but for a tourist it can often seem quite a strange and confusing place. As a host, I sometimes flounder as I try to remember the best things to do with guests. There are only a few ‘sights’ to see and no pedestrianised centre to the city. It’s not like Paris, or Rome or Budapest, where you could take a walk out of your front door and find historic charm and interest on every corner. Abu Dhabi does have a lot to offer, but you need know where to look. If you are a tourist or a guide, it’s often best to be armed with a plan. So if you are visiting and want to make the most out of your trip, or are hosting and want to show your guests a good time, here is my suggested agenda to squeeze the best out of Abu Dhabi. Your guests may be tired from their journey and wanting to take it easy, but still looking forward to their first taste of the UAE. Café Arabia is the perfect scene for the first breakfast. 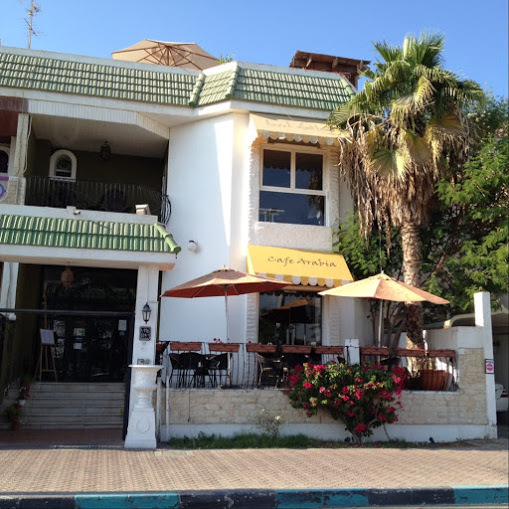 It’s got some Arabic favourites on the menu (and some cracking coffee for a good wakeup call), and its quirky décor is something a little different than the cookie cutter stuff that’s around. After you finished up there, pack up your swim gear and SPF and head down to Saadiyat Public Beach, to enjoy the white sands and the warm gulf waters. Whilst you are over that way, why not stop by to see the latest exhibition at Manarat Museum and once you are done there, it’ll be time to eat. 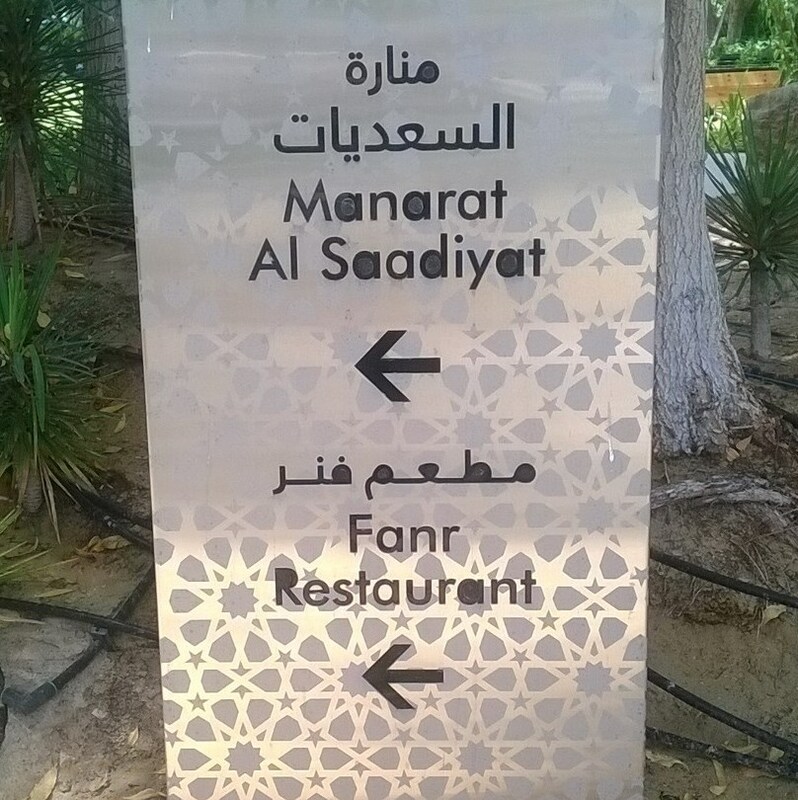 Fanr restaurant is a beautiful lunch or dinner venue. Outside they have incorporated the style of the traditional falaj irrigation systems to create peaceful water features, and its set with a backdrop of a lush green garden. Their outdoor majlis-type seating areas gives a quite casual feel if you are still a little windswept and interesting from the beach. And this is a perfect opportunity for your guests to try camel meat too if they are feeling adventurous – on a pizza or even in a burger form. See Cafe Arabia’s Facebook page, or find out more about Saadiyat Public Beach, Manarat Museum and Fanr Restaurant. Yesterday was relaxing, easing them into the groove. 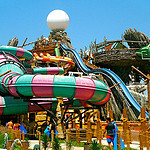 Today its time take it up a notch with a bit of excitement at Yas Waterworld. If you have an Entertainer book, don’t forget your vouchers for 2 for 1 entry. But first, fill up on breakfast – the food is fine in Waterworld, but serves only to ‘fill a hole’. Café D’Alsace on Yas Marina is the perfect place to pick up a continental breakfast and from here you will be overlooking the space age looking Yas Viceroy hotel, straddling the F1 track from across the water. Don’t fill up too much though, there are plenty of family-friendly rides, but there are a few white knuckle ones, including one with a count-down capsule drop – that will have even your toughest friends feeling the thrill. This activity is great as being water based, it can be done all year round, but if going in summer, make sure you pack some shoes you don’t mind getting wet as the floors get very, very hot. A day of trudging up a tonne of stairs is probably going to leave anyone over the age of ten feeling exhausted. After this you may want to go home and enjoy a quiet night in. If you have one, now is a great time to fire up the BBQ and grill some meat, and crack open your deli counter hummus, moutabal, stuffed vine leaves and Arabic bread for an easy prep meal. Failing that, check out Food on Click for takeaway options. The Lebanese Flower is a firm favourite amongst expats but we prefer delivery from Mono Lebanese Restaurant, just a few doors down; especially their generous falafel portions. Find out more about Café D’Alsace and Yas Waterworld. No first-timer’s trip is complete without a trip to the Grand Mosque. As well as being incredibly impressive and free, if you join a tour they also give you some great insights into the region and Islam that are genuinely interesting. The mosque is cool to see but it’s the stories that really bring it to life – it’s really worth taking the tour. Visitors are also able to (and may be required to, depending on their attire) borrow an abaya or kandoora, they just need to provide an ID which will be held as a deposit. Then head to Capital Gate Hotel for a spot of lunch. It leans a whole 8 degrees more than the leaning tower of Pisa. As the most leaning tower in the world, it’s a cool architectural feat to witness. The restaurant, 18 degrees, is named after the accolade, and has a great vista of the surrounding area. You can sit outside too in the cooler months. 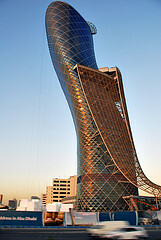 Find out more about the Grand Mosque and the Hyatt Capital Gate. There are tonnes of things to do in Abu Dhabi, but any first time visitor will thank you for making time to squeeze in a trip to Dubai. If you are just doing a day trip, its maybe worth checking out the Big Bus tour to cover all bases. Your ticket entitles you to two routes; it’s is pretty concise and even includes a free Dhow cruise. However if you don’t feel like cramming it all in, the Dubai fountains, Burj Khalifa and Souk Bahar are all in walking distance, along with a whole host of dining options so this if you are really pushed for time, this is a one-stop shop for a quick taste of modern Dubai. Check out the prices and details for the Dubai Big Bus Tour or book tickets for At The Top, Burj Khalifa. If, like me, most of your guests are from cooler/wetter climes such as England, they will relish any opportunity to get in the sun. 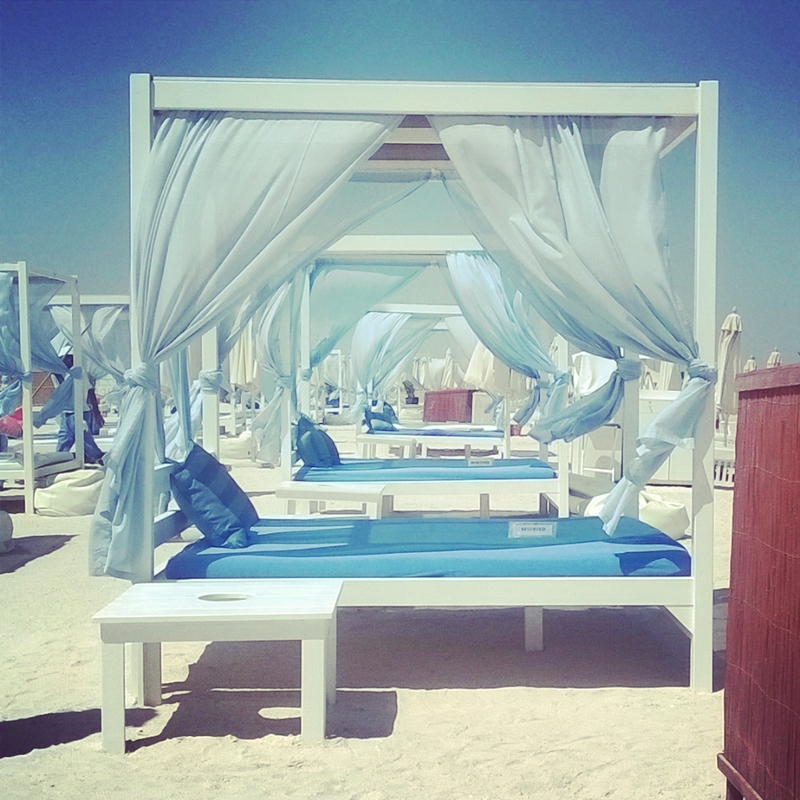 There are some lovely hotel beach clubs that do day passes which is nice if you are spending the full day there (Al Raha Beach and Fairmont Bab Al Bahr often have discounted passes on Groupon), but Yas Beach is often a cheaper option. Its licenced, and only 50aed to enter on weekdays, which includes towel and sunbed hire. After a relaxing morning spent there, time for a taxi home, get showered and have lunch. Around 2pm, make your way to your desert safari pick up location (make sure you have pre-booked). This is a great send off for any visitor, as they finally get to see the desert dunes, ride a camel, watch a belly dancing performance, normally arriving home around 9pm. An Arabic BBQ buffet is normally included in the price, but the packages do vary so call to check. Quad biking and other activities are normally available at an extra cost. A perfect way to end the holiday. Find out more about Yas Beach prices and opening hours on their website. 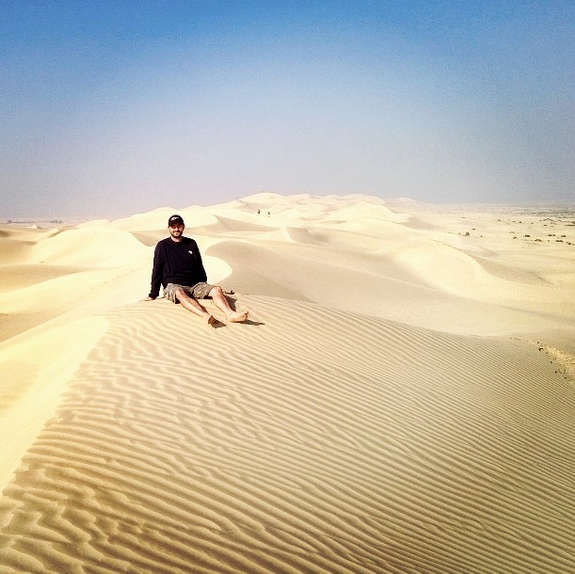 There are a number of Desert Safari operators in Abu Dhabi, Arabian Adventures is just one of them. Above just lists a few of the hundreds of options and combinations of things to do in Abu Dhabi. Are there any key sights, eateries or activities that you think I have missed? Let me know in the comments below and I’ll include them in my upcoming ‘More Things to Do’ post. The woman who would be King. Boltonian. Digital Marketing Associate Cleveland Clinic Abu Dhabi, views all mine. Love snow sports, pre-loved clothing and sloths.